In the sixth pAsuram, AzhwAr says “There is no mental grief for me who got to enjoy krishNa’s activities of killing the enemies”. Subsequently, AzhwAr says “There is no mental grief for me who got to enjoy krishNa’s activities of killing the enemies and won over the three worlds in his previous incarnation, to eliminate the ego of mahAbali”. pagalirAp paravap peRREn enakkenna manap parippE? manapparippu – grief is there? emperumAn tore the beak of bakAsura who came focussed in battle; he angrily killed the bulls which were having humps; he broke the tall and well grown kurundhu tree; including these and many other activities relating to killing of enemies were manifested to me by the great benefactor, krishNa who measured the expansive earth as thrivikrama to eliminate the ego of mahAbali; having got to praise these amazing activities day and night, without any difference, what grief is there? Implies that only when bhagavath anubhavam is absent, grief will be present. 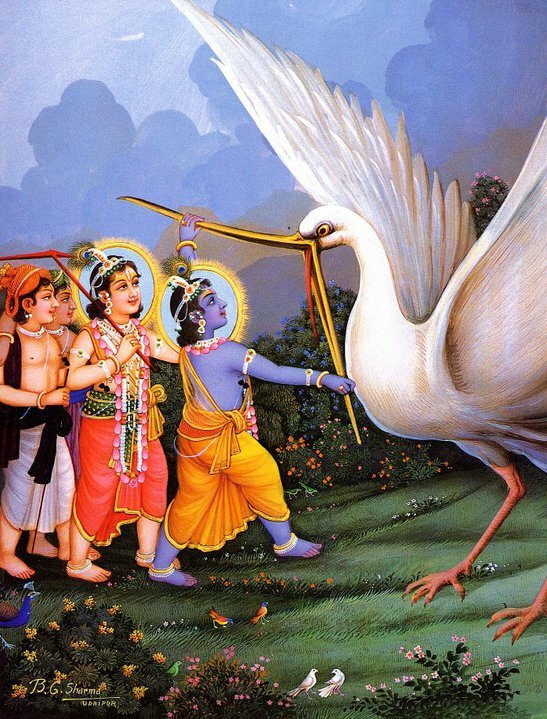 igal koL puLLaip piLandhadhum – (igal – battle) It just did not appear as a bird, but also was fiercely focussed to fight with krishNa, and krishNa killed it. Though the demon came to kill krishNa, he assumed a bird’s form which will not threaten anyone so that others would not mistake him to be coming to harm krishNa, as said in periyAzhwAr thirumozhi 2.5.4 “paLLaththil mEyum paRavai uruk koNdu” (assuming the form of a bird which is gazing in the shallow area). imil ERugaL seRRadhuvum – how he killed the bulls with the humps. uyar koL sOlaik kurundhu osiththadhum – Breaking the kurundhu tree which was tall and bushy. It grew out nicely thinking “this will be attractive for children”; krishNa broke it into pieces thinking “let me break it”. utpada maRRum pala – There are many such destroying of enemies by him in this manner. agal koL vaiyam … – Many such amazing activities only of such emperumAn who effortlessly measured the expansive earth. pagal irAp paravap peRREn – Wordly people have divided the time into day and night, to engage in worldly pleasures; for me who got to enjoy emperumAn’s activities during both day and night, is there the same mental grief of those who enjoy worldly pleasures? parivu [paribu] – grief; even if paribu is read as parippu, it has the same meaning. This entry was posted in thiruvAimozhi, thiruvAimozhi 6th centum on January 16, 2018 by Sarathy Thothathri.